It’s Pizza Night at Casa di Mintz. Two perfectly plump dough balls dusted with 'double zero' flour sit in shallow pools of olive oil, waiting to be tossed and turned. Ramekins line the countertop filled with the likes of crispy pancetta, sautéed shitakes, and balsamic reduction. Sometimes there’s fresh pesto. Usually there’s burrata. There’s always wine. This, friends, is what I call heaven. More accurately, I call this home. My dad, master pizzaiolo that he is, has been spearheading Pizza Night for more than a few years now. The frequency at which his dough recipe is tweaked occurs almost as rapidly as his obsession with artisanal pizza has grown. His arsenal includes a Kitchen Aid Mixer (see: the FIRST Pantry Raid), food processer (all hail Cuisinart), a magical wand that you point at the oven and it tells you how hot it is, and his iPhone*. *The iPhone is there so he can post braggy photos that make people hold their breath for the day they get invited to Za Night. Take a look at #crustcam on Intstagram. Time to get on my good side, folks. Back in the kitchen, it’s 8 PM and time to get cooking. We put on some Sinatra and clear out, letting Dad do his thing. If you’ve ever been in the kitchen with me, you know I like the hold the reins. Well, if you’ve ever wondered where I get it from, talk to Mark Mintz. Disclaimer: he’ll probably try to sell you a house. I’m not complaining though…I’ll happily give the man his space in anticipation of The Best pizza in the world. And it is! No matter what combination of fancy flour the guy uses or from whatever distant place the olive oil has travelled, Pizza Night never disappoints. But that moment – the one I just mentioned where I’m sitting on my tuchas while Dad does all the work – I had to earn that. The day before, I played sous chef, passing flour, chilling water, and answering real estate calls, all in the name of what we call The Dough. The day of, we trail through the supermarket aisles debating over which toppings to try, always ensuring that we get out of there with the makings for at least one OG Mintza. Back in the days of Trader Joe's dough and store bought pizza sauce, the formula for Pizza Night was simple. Dough + sauce + fresh mozzarella + prosciutto + caramelized onion. But, then we asked ourselves, why make things easy? Easy tasted good, but not GREAT. Today’s OG Mintza is made of whatever dough Dad’s currently perfecting, this raw pizza sauce, burrata, crispy prosciutto, caramelized onion, and then balsamic reduction drizzled on top. It’s my #1 Must Have every time I come home, and always ends up with The Dez and me licking the plates. So, here’s Dad’s Raw Pizza Sauce. It’s fresh, with a little kick, and is freakishly easy to make. 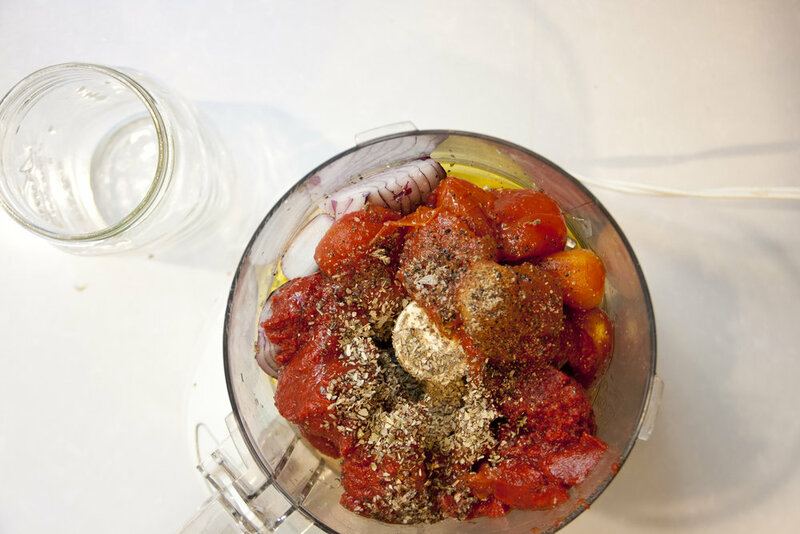 Similar recipes will instruct you to defame your sauce by simmering it to “bring out the flavors.” Trust me – they are wrong. San Marzano (and you must use San Marzano) tomatoes are holy, I tell you. Simmering them would be like adding a cup of sugar to whipping cream or putting a spoiler on your VW (I’m looking at you, Craigslist). You just shouldn’t do it. Like my pal Alice Waters says, stick to good ingredients and your really don’t have to do much legwork. Anyway, I’m sworn to secrecy as far as dough is concerned, but I will say that Trader Joes’ dough isn’t half bad. 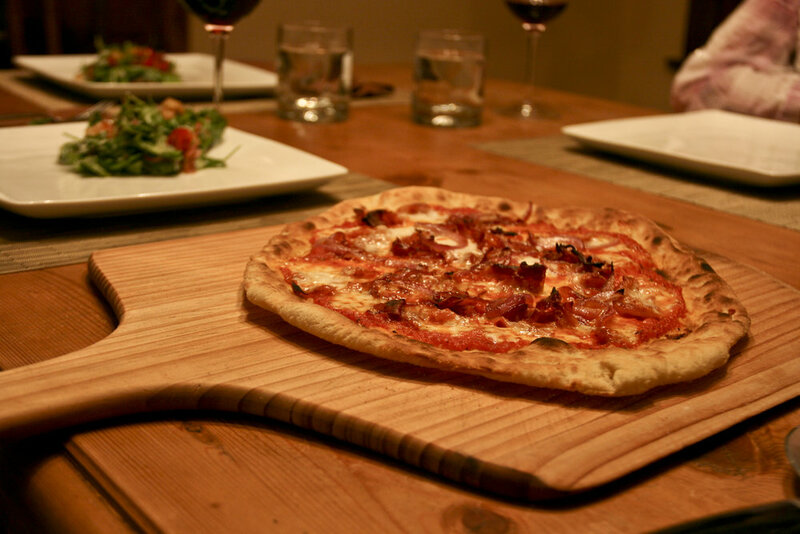 If you want to try your hand at true pizzaiolo-dom, try Nancy Silverton or Gabi Moskowitz’s recipes. Whatever you do, ditch the Dominoes and do Pizza Night the right way: with this sauce, your own dough, and a couple bottles of wine. And don’t forget to invite me! 2. 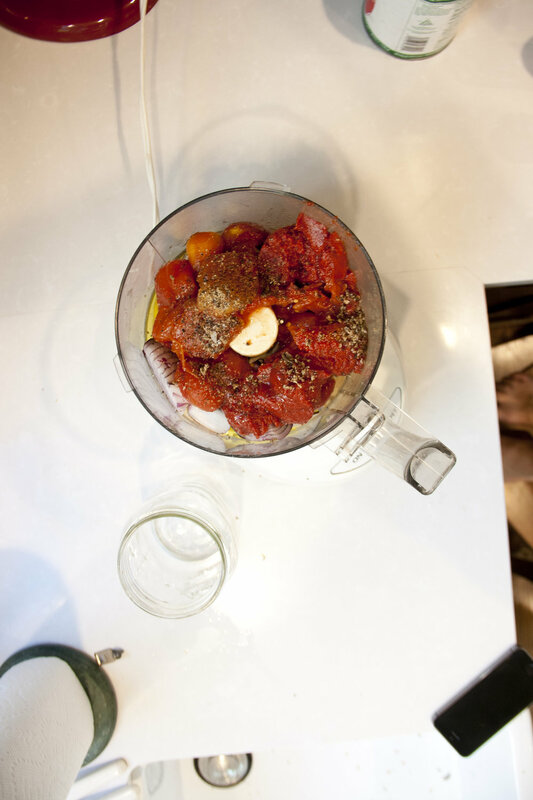 Add all ingredients to a food processor and blend until combined.